The Ending of LOST is still one of the more controversial television events of the past decade. Maybe you thought it was beautiful (like me), maybe you thought it was painfully heavy-handed (like most people), and maybe you thought they were dead the whole time (which they weren’t, you dope. Go watch it again). But if there’s one thing every LOST fan can agree on, it’s that “The Constant” marked a creative and emotionally resonant peak for the show, and is perhaps one of the finest hours of television ever produced. It also happens to be a sort-of-kind-of Christmas episode. But perhaps it’s fitting that LOST‘s only Christmas episode isn’t really a Christmas episode, because “The Constant” is a LOST episode that isn’t really a LOST episode, or perhaps it is the perfect example of what a LOST episode should be. I really don’t know. LOST was always confusing like that. Now, LOST was such a spectacular show in part because of how unpredictable it was, and not just from a plot-twist standpoint, but from a structural standpoint. Throughout its six season run, there were many wonderful episodes, several weak episodes, but never a formulaic one, in part because there was never a formula established in the first place. Just as we were settling into a groove with flash-backs, the series would throw in a clip episode, except with clips from another part of the island featuring new characters which we had not previously seen (“The Other 48 Days”), or an episode that takes place entirely in the past (“Flashes Before Your Eyes”), or introduce the concept of a flash-forward (“Through the Looking Glass” and all of season four), or a flash-sideways (most of season six…sort of). But what could always be predicted about an episode of LOST is that it could not be predicted, that the episode would not in the least be self-contained, and that characters would generally end up in a much worse place than when they started. And this is where “The Constant” becomes rather special. The Constant is one of perhaps only two episodes of LOST that succeed as self-contained works (the other being the pilot, which remains one of the best pilots in the history of such things). One does not need to see the previous half-billion episodes and be up to date on their backgammon visual allusions and Dharma mythlogy to understand what is going on (though it helps); this is an episode with its own unique narrative structure, a single character arc, and one of the show’s most satisfying emotional resolutions. Also, it’s Christmas, and the episode’s lead character is often portrayed in the show as a Christ-like metaphor. So there’s that. That Christ-like metaphor in question is Desmond Hume (to reveal why he’s Christ-like metaphor would spoil much of LOST, and also, who cares?) 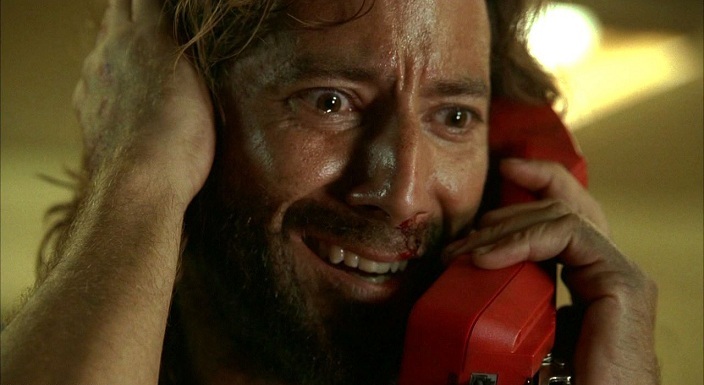 and Desmond Hume has become unstuck in time. Only not his body, so much, but his consciousness. Desmond has recently been exposed to an inordinate amount of electromagnetic energy, and in LOST, that generally means (as Daniel Faraday will tell us) “side effects.” The side effects in this case being consciousness-time-travel, which would not be all that bad were it his present consciousness doing the traveling, and not his 1996 consciousness. But it is the latter, and in 1996, Desmond is in the Queen’s Army. This is inconvenient. And thus begins a great deal of madness. The episode follows Desmond’s consciousness as it jumps back and forth through time with increasing frequency. It is the sort of thing that would drive anyone crazy, and that, as we find, is the trouble. What Desmond needs to keep from losing his mind completely is a Constant—something that exists in both his present (1996) and the show’s present (2004) to help his mind from collapsing with disorienting confusion. The Constant, it would turn out, is his one true love. Penny. To save himself (and, in effect, their relationship *BOOM*) he must find Penny in 1996 and get her to call him (he’s on a freighter off the Island with access to the phone…it’s a long story) eight years in the future to the day and hour. Which is 2004. Christmas Eve. Now, I, like many other of the show’s characters, do not celebrate Christmas; but I also, like most people with a beating heart, do always enjoy a good “Christmas Episode.” The Christmas Spirit, in actuality, is more of a nice thought than a really nice thing; during Christmastime, people are generally quite stressed about the difficulty finding parking spaces, the annoyance of hanging elaborate decorations that are only really fashionable for about three weeks, and being forced to buy presents for people they may not very much like. But in Christmas Episodes, The Christmas Spirit is a wonderful thing, wherein faith is rewarded, relationships are rekindled and true love is often found. This is why “The Constant” is sort-of-kind-of a Christmas Episode. I will not ruin the ending of the episode, because I think you should watch it, but suffice it to say it is a happy one. It is about losing your mind only to find it in a better place, about resparking relationships that were once doomed to fail, about finding true love when it is at its most needed, and being rewarded in the faith that sometimes people will do the right thing. Basically, it is an episode in which good things happen to good people, a thing for which LOST was not, until its final season, very well known. That it is a Christmas Episode is not important, or perhaps it is incredibly important. I really don’t know. LOST was always confusing like that. Tomorrow: Come on, get merry! I have never seen this show, but damnit, this has got me curious. I think I could just watch the pilot and not have to worry about getting hooked thereafter…?? But LOST is up there with The Wire, Breaking Bad and Mad Men as one of the best serialized dramas of the past decade (it’s very different in tone, obviously. Ain’t no magical islands and time travel in Mad Men). Even if you end up hating the ending, it won’t ruin the ride for you. It’s a fun one. This was a fantastic episode, probably my favorite. Love that this hasn’t been forgotten. Lost is/was the best series period. Not even an opinion. It’s such a strong and unique story. I could go on about the ending but that was the best ending I’ve seen. For whatever the hell you actually believe in, you have to see the beauty in that of that even if it’s purely internal. I’m so glad I’m not the only one who found it beautiful, Brandon. I’ve never had that strong of an emotional reaction to a tv show or movie before. LOST is by far my favorite show of all time; aside from Season 2 (which doesn’t hold up well the second time around) I’d say it’s a perfect show. I was hooked by the pilot, but I didn’t make it to the end of Lost. I’m not sure who failed who. There’s probably a lot of blame to go around. I stuck with it into Season 2. Terry O’Quinn and Sam Anderson were so good, but Michelle Rodriguez was truly awful. I just felt like it was a treadmill in which the build up to the cliffhanger was always great, but the resolution was always a massive disappointment. Season 2 is a bit of a clunker for sure. But if you stick with it…well Michelle Rodriguez isn’t in it for long. And the last few episodes of the season are astonishing.